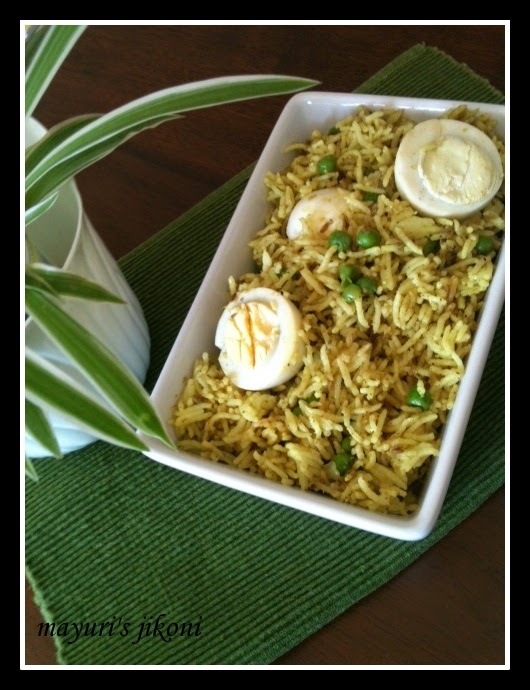 When my mum would make peas pulao, sometimes she would boil some eggs and add to the pulao as a special treat for the kids of the family. It would be a wholesome meal for us. My mum had never ever tasted eggs and had never seen cooked eggs in her village in India till she came to Kenya. Nowadays eggs are widely eaten all over India. Some families may not eat meat but eggs are consumed as a source of protein. I made this pulao a few days ago and its an excellent dish for all the football fans. Make the pulao and serve later. Till then let the flavours infuse into the rice dish. Add vegetables of your choice. Making fresh spice mixture adds a different flavour to any dish, but if you are running short of time, then add any pulao spice mixture you have. What is so special about the home made spice you may wonder? Well, I have added mace or javantri to the masala (spice mixture). Mace is the net like sheath that covers a nutmeg. The dried aril can be golden yellow or reddish orange in colour. It has a strong nutmeg, cinnamon and pepper combination like taste, and has an equally strong smell. Wash the rice. Rinse it gently in water 3 to 4 times. Add 4 cups of water to the rice and let it soak for 30 minutes. Add 1 tsp salt, 1 tbsp ghee, ¼ tsp turmeric powder, 3 to 4 cardamoms, 4 cloves and ½ inch cinnamon stick to the rice. Cook the rice till it is done. Remove the rice into a big tray or plate. Separate the grains gently with a fork and let it become cold completely. Heat ½ tsp ghee in a small pan over low heat. Add bay leaf, cinnamon, cloves and pepper. Stir fry for 30 seconds or so. Add the rest of the spices and roast for 1 minute or so. Grind it and keep on the side till required. Heat oil and remaining ghee in a wide pan over medium heat. Add the minced onion and cook till it turns light brown. Add garlic, ginger and chilli paste. Stir fry for a few seconds. Add the ground spice mixture and remaining salt. Mix well. Add 2 tbsp of water so that the spice mixture does not burn. Add the rice and mix it gently with the spice mixture. Add the boiled peas and boiled eggs. Cover the pan, and heat over low heat. Serve with your favourite raita or plain yogurt. To check if eggs are fresh, put each one in a glassful of water. If it sinks then the eggs are fine.If it floats to the top, discard the egg. Boil eggs with a tsp salt. It makes peeling them easier. Tear the bay leaf into smaller pieces to make roasting easier. Add more ghee to make the rice more flavourful if you like.